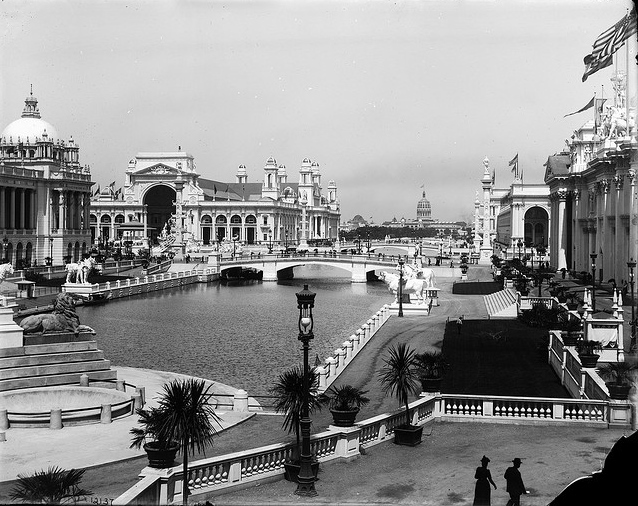 Ever since I read Erik Larson’s book, The Devil in the White City, I’ve been fascinated by the Chicago World’s Fair in 1893, the World’s Columbian Exposition. The book is the story of the fair interleaved with a murder mystery – a great read! Especially for a Chicagoan like me. When one of our major museums hosted an exhibit about the fair, I was eager to attend. A few years earlier, another had displayed a collection of photos of the fair from conception through to the demolition and I learned a lot. It didn’t take much for me to convince my husband to join me one winter afternoon when we were bored and searching for amusement. The exhibit contained materials from the fair. There were tools and other implements and samples of everyday and ceremonial dress from countries that would have been truly foreign in an era that pre-dated mass communication. There were science exhibits such as stuffed animals (not the cuddly kind) and what would have been technological marvels of the time. They had sample tickets and souvenirs from the fair. What was missing was stories. The things were interesting, but I wanted to know more about the stories behind the fair and what it meant in the context of its day. They said how many people attended but there weren’t any stories about who attended and what it meant to them. Many of the people travelled long distances to attend the fair, a marvel in its time, and I would like to have learned about some of them. The Columbian Exposition was an amazing accomplishment and triumph for the city of Chicago, a city that had largely burned to the ground only twenty two years earlier. As a lifelong Chicagoan, I wish the exhibit had reflected more of that. The things were interesting, but telling some of the stories would have brought them to life. This entry was posted in Book recommendations, Home, Memories, Reading, Stories. Bookmark the permalink.